Cuba is the largest country in the Caribbean, sitting between the Caribbean Sea and the Atlantic Ocean. 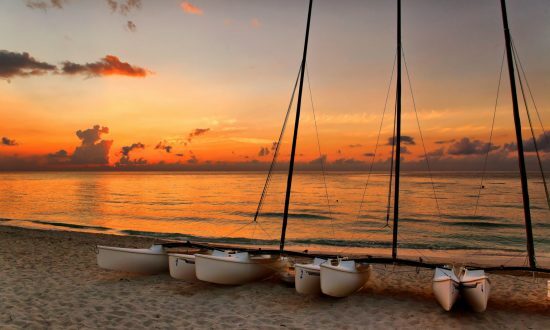 It’s popular with sailors for its favorably warm climate, steady winds, natural beauty, and open-minded, friendly people. When Christopher Columbus discovered the island in 1492, he said: “This is the most beautiful land one has ever seen.” Get in touch with our team today or request your free Quick Quote for Cuba. Cuba is the westernmost island of the Greater Antilles, located just 90 miles from Key West, Florida, around an hour of flying time. If short leg island-hopping is your dream charter, this is the perfect destination as the archipelago has 4,000 cays and islets. Your backdrop includes mountains, agricultural valleys with tobacco fields, colorful city architecture and sandy beaches. The famous Havana Club rum can’t go without a mention too! The gorgeous Cuban coast and off-lying islands are ready for you to discover and the archipelago de los Canarreos is within easy reach of our base at Cienfuegos. Cuban cities such as Trinidad and the capital, Havana, are renowned for their bright architectural richness and scenic beauty. They are now protected by UNESCO World Heritage. You can learn to dance the rumba or salsa or take a ride in a retro classic American car from a bygone era. 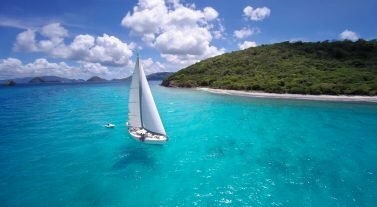 The island has a reliable nautical infrastructure, which is receiving well-aimed support from the government and makes a Cuban charter easy for all sailors. About 20 marinas and nautical centers all around Cuba gladly welcome yachts under all flags and offer a range of services. 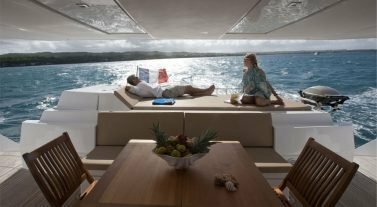 Dream Yacht Charter in Cuba: Our diverse fleet of catamarans and monohulls for bareboat yacht charters are based in Club Cienfuegos – Punta Gorda, Cienfuegos. 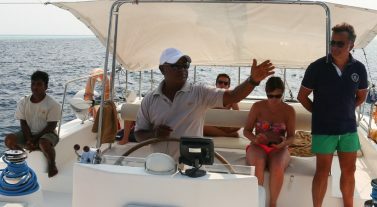 If you are looking for an all-inclusive experience, try our cabin charters. Our Cuba base team will receive you warmly and look after you, giving local tips and advice. If you need help planning your charter, check out our Inspirational Itineraries section or get in touch with our team to find out more. The time difference in Cuba is Coordinated Universal Time (UTC) -5 hours. Make sure your documentation is in order to travel and complies with regulations to travel to Cuba – check with your country of origin’s embassy. There are travel restrictions for US citizens, who also need to have non-US medical insurance, which you can buy from the airport on arrival in Cuba. You will also need a tourist card from the Cuban consulate and the departure tax is now collected by your airline when you purchase flights. The government-run bus routes are cheap but popular so buy your tickets the day before. Renting a car is expensive and difficult so book ahead. Cuba’s car fleet is known for its vintage gems and you can hail a vintage taxi, which is an experience in itself. We can help with airport transfers. Travelers must declare cash amounts over $5,000. The government charges 10% for all US dollar cash conversions. There are strict regulations about bringing satellite phones, GPS or DVD players into Cuba. Cuba has a dual currency system where locals use the Cuban Peso and visitors use the Cuban Convertible Peso. American Express and credit and debit cards belonging to US banks are not accepted in Cuba, so bring enough cash to cover your stay. Only change money at Cadeca exchange houses, large hotels or banks and ask for small denomination bills. Banks are open Monday to Saturday between 7:30am and 3:30pm. Cuba has very low rates of internet connectivity, although this has started to change in some of the bigger cities, where there are some Wi-Fi hotspots at modern hotels and internet parks. You can buy pre-paid NAUTA Wi-Fi cards from the state-run telecom company ETECSA, but some sites have restricted access. There can be a two-hour wait for a card at some kiosks at peak times. Fishing with a harpoon and lobster fishing are forbidden. Temperatures in Cuba are sub-tropical to tropical and there are two distinct seasons. The dry season is in winter, between November and May with temperatures around 77ºF. The summer, between May and November, is wetter and hotter with temperatures around 82ºF. Sailing conditions in summer feature heavy, short bursts of rain later in the day. Winds are north-easterly between 15 to 25 knots but can be highly variable depending on the tropical depressions in the Gulf of Mexico and Bahamas. Sometimes they can vary from 5 to 35 knots. Day 1: Explore Cienfuegos with its striking and brightly-colored French colonial architecture flanked by palm trees, wide streets with covered sidewalks and a vibrant waterfront. Head to Parque Jose Marti, a large square home to great street food, shops, free Wi-Fi and a bandstand. Walk Punta Gorda, dine at the nearby restaurants and watch the sunset. Take a taxi for an hour further inland to the El Nicho waterfalls, where you can swim in the less busy lower pool. As you head to Guano del Este, keep a look out for Jagua Castle at the entrance to the bay and dolphins. Guano del Este features a strange-looking lighthouse and sandy beaches with coral in shallow waters. Day 2: Spend the day at Cayo Largo, a small limestone cay which was popular with pirates wanting to hide their treasure. You can anchor off Playa Sirena, which is a fabulous beach fringed with palm trees and amazing snorkeling, although the waves are invigorating. Make sure your camera is ready, as photos taken here will be the envy of all with its glittering turquoise waters and plenty of soft white sandy beaches to choose from. 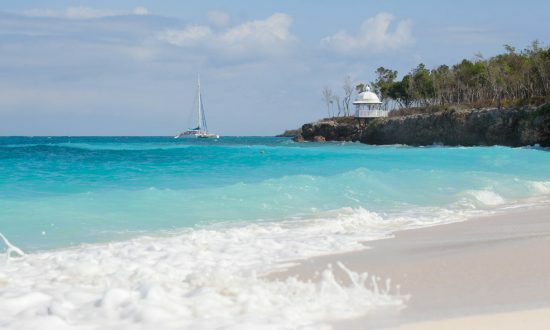 Try Playa Paraiso, which was rated by TripAdvisor as one of the top 25 beaches in the world, or, if you want seclusion, head west of Sol Cayo Largo. 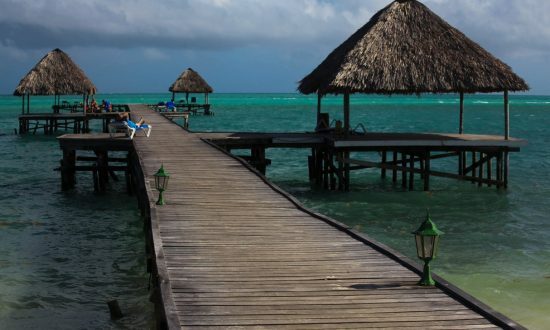 Day 3: Spend the day exploring Cayo Largo in the morning. Animal lovers can visit the Sea Turtle Hatchery, Centro de Rescate de Tortugas Marinas, which is part of a major conversation program. Keep watch for the resident iguanas too. After lunch head to Quinto Canal, about 30 minutes away, where you can bathe in a natural pool off a sandbank that is calm and warm. Sail onwards 40 minutes to the Cayos Los Ballenatos coral reef, which is great for snorkeling and has vibrant underwater marine life. You’ll spot plenty of tropical fish and perhaps even sea turtles. You can head back to Quinto Canal or Cayo Largo overnight. Day 4: After breakfast make for Cayo Rosario, an uninhabited island except for a healthy population of iguanas. This is a popular diving and snorkeling location because of the richness and variety of fish and sea creatures. If you want to relax on the beach, you’ll find a stunning, large stretch of pink sand that wraps the lower part of the cay. You can spend hours looking at the shells and beachcombing. 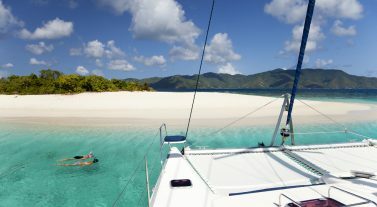 Day 5: Set sail for Cayo Estopa and enjoy the beach, lazy swimming and snorkeling. 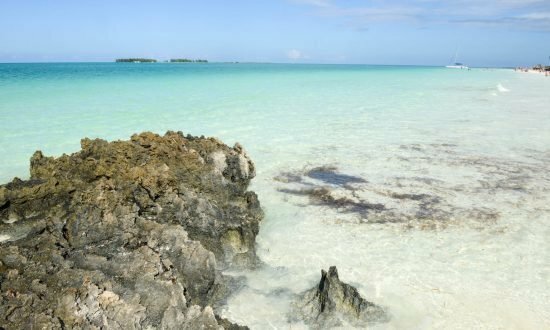 In the afternoon, sail to Cayo Rico with its light pink sands, healthy coral and fantastic shoals of tropical fish – you might even see large starfish and rays. This is a wild island with just one small seafood restaurant near the jetty, which is popular and reasonably priced if you want fresh lobster. As you relax on the beach, you can watch the iguanas scuttling around and they love eating fruit. Day 6: Head back to Cayo Largo to relax on one of the many beaches. Dine at the beach grills (ranchóns) at lunch time where you can order shrimp and lobster. You can also find a la carte restaurants, which are open in high season. If you are there on a Friday, you can take part in the weekly fiesta for a small fee. 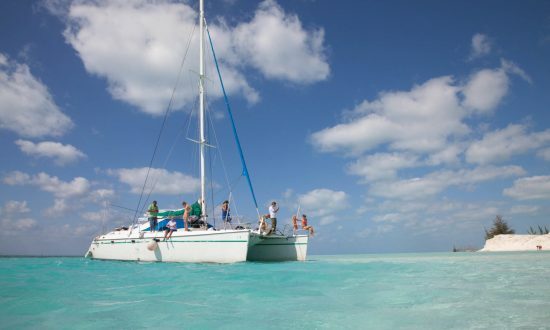 Sail onwards to Cayo Sal and explore the cay. Day 7: Head back to Cienfuegos before 10am to disembark. Our Cuba Base Manager will be pleased to welcome you on arrival at the Club Cienfuegos – Punta Gorda, Cienfuegos. The base is open 8am to 7pm, 7 days a week. You will find water, electricity, restaurant, bar, mini-market and washing facilities in the marina. Fly direct to Cuba’s José Martí International Airport (HAV), Havana, from Miami, New York, Fort Lauderdale, Orlando and Atlanta, or travel from surrounding countries. We can arrange airport transfers on request to our marina at Cienfuegos, which takes around 3 to 3.5 hours by taxi. Make sure your passport is in date and valid for the duration of your stay. We have visa advice under our Handy Info section. Monitor the weather and sailing conditions on Channels VHF 16 and 09 in Cayo Largo, Trinidad and Santiago de Cuba marinas. We recommend you provision in advance so that your supplies are ready for your arrival. Just fill in the forms in our Useful Downloads section and pay in cash on arrival. You can also provision in the marina from the mini-market. Verizon has a roaming agreement in Cuba, but don’t forget the roaming fees!